Beer guides can be especially prone to obsolescence. Open up Stephen Beaumont‘s The Great Canadian Beer Guide (2001) or Jamie MacKinnon’s The Great Lakes Beer Guide: Eastern Region (1997) and you’ll find numerous beers that are no longer being brewed, or breweries that are long out of business. While these two books  and many more like them  are well-written and enjoyable, they don’t exactly have the timeliness and accuracy of a web-based resource. But their instant out-of-datedness is actually part of their charm. They provide a snapshot of a particular place and time in the craft beer world, and flipping through one of them 2 or 5 or 10 years after it was published can bring back memories of long gone favourites, or tell you about some great beers that you missed out on back in the day. And sitting and reading one of them  preferably while enjoying one or two of the beverages featured in their pages  can be a great way to spend a lazy afternoon or evening. 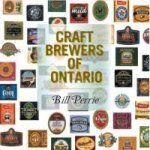 Bill Perrie’s Craft Brewers Of Ontario is the newest guide book to our region’s brewing scene, and the timing of it’s release is impeccable given the relatively high profile currently being enjoyed by the year-old Ontario Craft Brewers association. While not an official OCB publication, it has strong connections to the organization: all of the breweries featured in the book are OCB members (except for recently departed Church Key Brewing), and OCB president John Hay provides the forward. Also in on the fun is beer historian Ian Bowering, who provides a brief but enjoyable  and lavishly illustrated  history of brewing in Ontario to open the book. And speaking of “lavishly illustrated”, this book is easily one of the most colourful and graphics-heavy beer guide books that I’ve ever seen. Each of the eighteen brewery profiles features photos of the brewery owners, brewmasters and the breweries themselves. This lends the book a personal touch, giving the reader some familiarity with the folks that work behind the scenes on their favourite brews in a way that a text-only publication just can’t do. This familiarity is also enhanced by Perrie’s text which is written in an almost conversational tone. Each section of the book starts with a brief history of the featured brewery, which is generally presented in the context of the town where the brewery is located, emphasizing the community oriented nature of many of Ontario’s microbreweries. Attention is also given to the people behind the beers, with founders and brewmasters receiving more ink than the beers themselves in most cases. And if you’re familiar with Perrie’s previous books  The Pub Lovers Guide to Ontario and The Pub Lovers Guide to Canada  you won’t be surprised to learn that each profile includes several suggested pubs in the area of the brewery where their beers can be enjoyed. Observant craft beer fans will notice that the “eighteen brewery profiles” mentioned earlier in this review falls short of the thirty brewers who are members of the OCB. The exclusion of well-regarded brewers such as Denison’s and Scotch Irish is understandable given that they don’t own their own brewing facilities, but there are still several conspicuous absences in the book, most notably Amsterdam and Black Oak. Those unfortunate exclusions aside, the brewers that are included run the gamut from old-timers like Brick and Wellington to newcomers like King, Niagara’s Best and Robert Simpson, so a good cross-section of Ontario’s brewing scene is represented. As far as the descriptions of the beers themselves, Perrie doesn’t use any sort of rating system and steers clear of offering much critical analysis. Brief tasting notes are given for all regular beers from each brewery, but they are very objective, offering little in the way of judgements. Instead, there is a blank page for “personal tasting notes” at the end of each section, encouraging the reader to make their own call on what they like and what they don’t. This approach may be too diplomatic for some, and a few of the tasting notes can come across more as PR fluff than the opinions of a serious beer drinker, but in the context of the book, they serve the purpose of informing the reader of what is available and steering them towards trying something new and (hopefully) enjoyable. On the negative side, I found some of the profiles to be a bit light on content. Rather than just talking about the breweries and the people behind them, it would’ve been nice to see Perrie actually talking to them in the form of short interviews, or at least a direct quote or two. There are also some typos and editing/proofreading errors that are very distracting, most notably in John Hay’s forward where he refers to the book several times as Ontario Craft Brewing rather than the proper title. But these are minor quibbles. On the whole, I enjoyed this book, and I wouldn’t hesitate to point it out to friends who might be interested in exploring our province’s burgeoning craft beer scene. It may go out of date, but I’ll be holding on to it, and maybe I’ll pull it off the shelf a few years from now and remember the many beers that are mentioned in its pages. Hopefully, most of them will still be around.